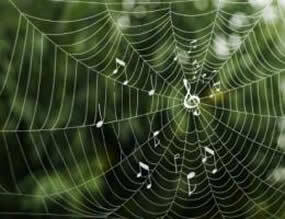 Using a new mathematical methodology, researchers at MIT have created a scientifically rigorous analogy that shows the similarities between the physical structure of spider silk and the sonic structure of a melody, proving that the structure of each relates to its function in an equivalent way. The step-by-step comparison begins with the primary building blocks of each item — an amino acid and a sound wave — and moves up to the level of a beta sheet nanocomposite (the secondary structure of a protein consisting of repeated hierarchical patterns) and a musical riff (a repeated pattern of notes or chords). The study explains that structural patterns are directly related to the functional properties of lightweight strength in the spider silk and, in the riff, sonic tension that creates an emotional response in the listener. While likening spider silk to musical composition may appear to be more novelty than breakthrough, the methodology behind it represents a new approach to comparing research findings from disparate scientific fields. Such analogies could help engineers develop materials that make use of the repeating patterns of simple building blocks found in many biological materials that, like spider silk, are lightweight yet extremely failure-resistant. The work also suggests that engineers may be able to gain new insights into biological systems through the study of the structure-function relationships found in music and other art forms.